Farmers do their version of the Kiki Challenge, dancing to Drake's song "In My Feelings." In the mud. With oxen. 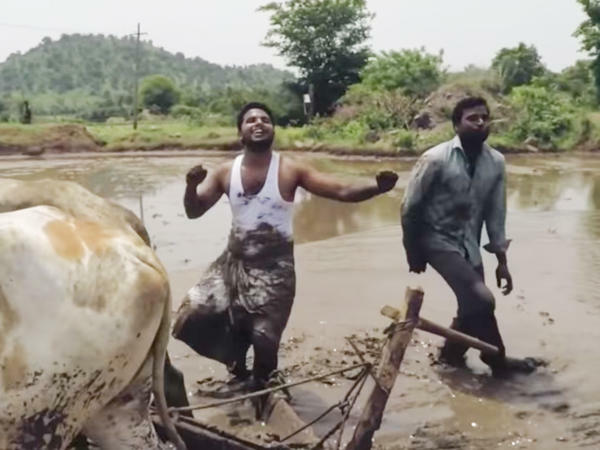 The rapper Drake probably never dreamed that his song, "In My Feelings," would inspire two Indian farmers to dance in the mud — with their oxen. The song is addressed to a woman named Kiki: "Kiki, do you love me? Are you riding? Say you'll never ever leave from beside me, 'cause I want you and I need you and I'm down for you always." In July, Instagram comedian and social media influencer Shiggy issued what he called the Kiki challenge. Dancing exuberantly, he asked his followers to shoot videos of themselves dancing to the lyrics. His dance set social media feeds on fire, as people all over the world offered their version of the jig – and sometimes did dangerous stunts. A teenager in Iowa was critically injured when she jumped out of a slow moving car. Now, about those farmers... Sriram Srikanth, 27, Anil Geela, 24, and Pilli Tirupati, 28, have lived most of their lives in the village of Lambadipally in the southern Indian state of Telangana. "Feelings" was the first English song Geela ever heard; he says he instantly fell in love with the lyrics. And his and his fellow farmers were definitely up for the Kiki challenge. For the farmers of Lambadipally, a day "riding" doesn't mean driving in a car. It means using the local means of transport — a pair of oxen! As director of the YouTube channel 'My Village Show,' Srikanth says he's been documenting village life and culture for over five years. He uses humor to explore how villagers react to modern influences. In one episode, he introduces the elderly women in the village to a burger for the first time and records their reactions. "Oh, so this is what a burger is! Curry in bread," exclaims one. "This burger costs one hundred rupees?" cries another. In other episodes, he coaxes villagers to use selfie sticks and introduces them to virtual reality technology and fidget spinners. When Srikanth heard about the Kiki challenge, he and his two friends didn't need to come up with choreography. "We decided to do the moves that came naturally to us," says Srikanth. It took 45 minutes to shoot the 39-second video for Instagram. Monsoon season — going on now — is harvest time for rice. So while Srikanth manned the camera, Geela and Tirupati shook their booties while plowing the muddy rice paddy fields behind two oxen, something they do every day. They said they didn't mind the mud at all, since they walk in the paddy fields all the time. It wasn't difficult to find their footing and dance. But they never dreamed they'd dance their way to global fame. They posted the video on August 1 on Instagram and Youtube, and the rest is Kiki challenge history. Their Youtube channel now has 492,000 subscribers. Their video has had over three million views over the last four days. Desi style means Indian style and Mera Bharat Mahaan means "My India is great." "This is our village style of dance, and it was all done in the spur-of-the-moment," laughs Geela, who calls himself a bathroom dancer, a part-time farmer and a full-time actor for My Village Show. Geela once taught mathematics in a nearby town. But he missed the friendship and close bonds of village life so much that he returned to his roots and to farming. He's also happy to show that all the news from India's farmers isn't sad. The farming sector has faced many challenges over the years, from drought to too much rainfall to a lack of trained labor. But there are sweet and playful moments in farmer's life as well, he says. "Dancing in the mud is fun — it's eco-friendly and safe," says Geela. "Many village experiences are pure unadulterated joy. And that's what we hoped to convey." As for the villagers in their hometown, they can't believe their video could spark worldwide interest, says Srikanth, and they wonder what the fuss is all about. Kamala Thiagarajan is a freelance journalist based in Madurai, India. Her work has appeared in The International New York Times, BBC Travel and Forbes India. You can follow her @kamal_t.